Teixeira MZ. 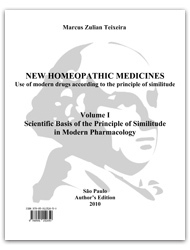 Scientific basis of the principle of similitude in modern pharmacology. São Paulo: Marcus Zulian Teixeira, 2010, 377 páginas. Building a bridge between homeopathic pharmacology (principle of similitude) and modern pharmacology, one can find countless reports in pharmacological compendia and clinical and experimental trials published in the scientific media describing the secondary reaction of the organism opposed to the primary action of the drug, which confirm Hahnemann’s theory. Such secondary action of the organism to preserve organic homeostasis is known in modern science as rebound effect or paradoxical reaction, being used by homeopathy as a therapeutic response.